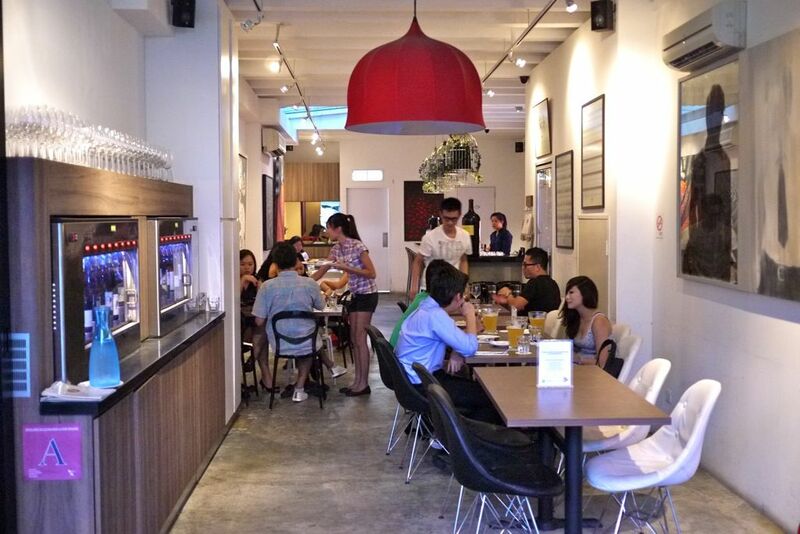 I love the Duxton area for the copious cafes, restaurants and quaint little stores, as well as the generally laid back atmosphere any time of the week. I've been rediscovering da hood these couple of weeks so you can be expecting a few more restaurants to be added to my Duxton list. 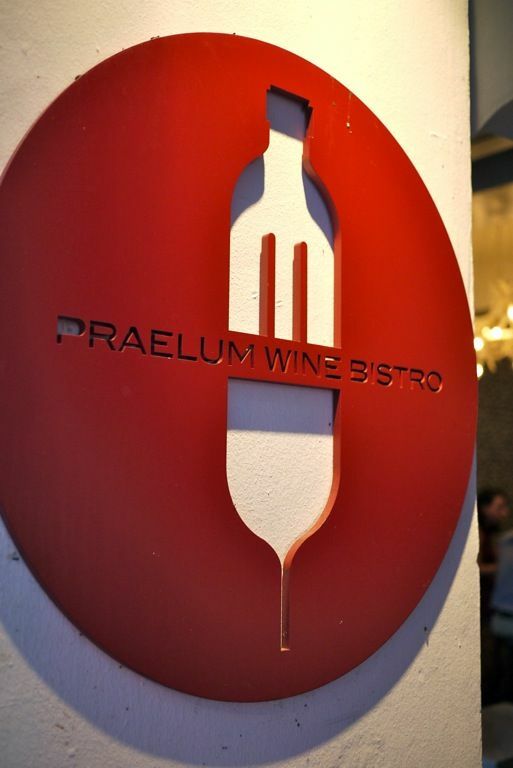 So happens that Praelum Wine Bistro is a restaurant under the Palate Card and that gave me a chance to utilize my privileges! 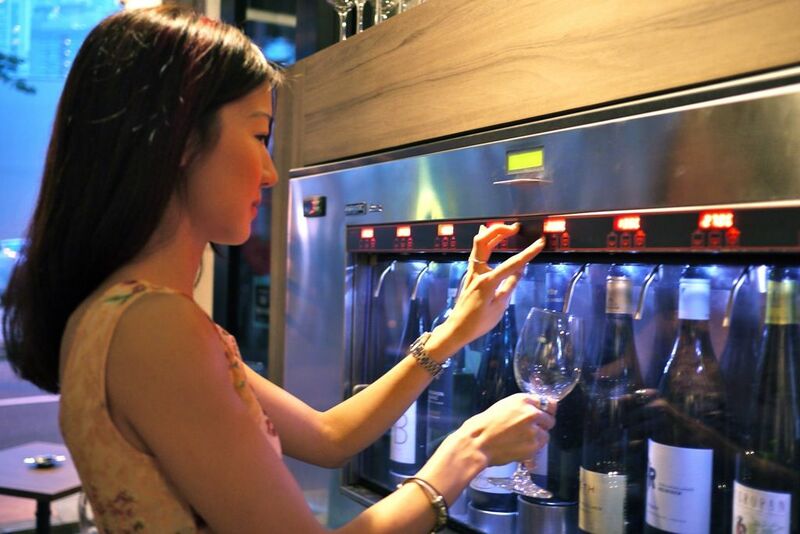 Nothing good happens when you put 2 hungry girls in a wine bar, especially one that easily allows you to taste the various wines with their automated wine dispenser. After Amanda, our young and bubbly sommelier, passed us our wine card, we proceeded to have a little wine tasting of our own. The drinks are available in 3 sizes, tasting, half and full glass. This is great because you could try many bottles before deciding on the drink (or drinks) for the night. If you don't know what to get, Amanda is really good at giving recommendations. My Austrian Leth- Roter Veltliner Schieben was aromatic, extremely concentrated, smooth, round and waxy on the palate with a bit of spice and racy acidity. I found this a great food wine that is refreshing and friendly. 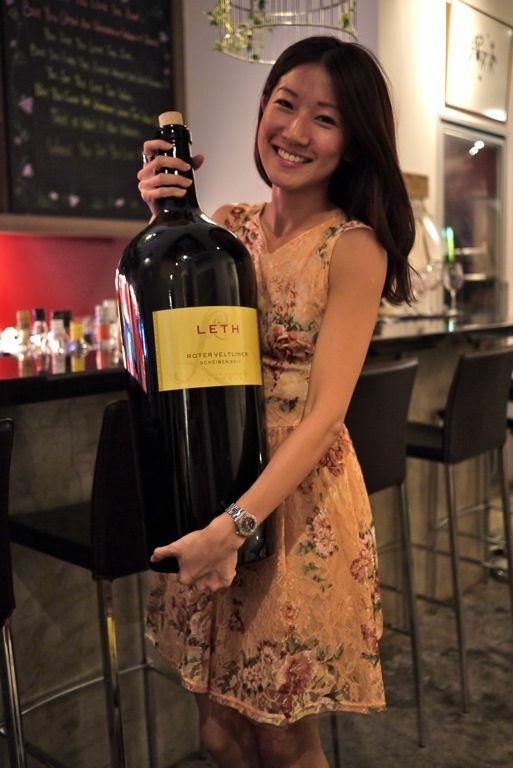 It's so good i decided i should just bring the whole bottle back to the table. Heh. 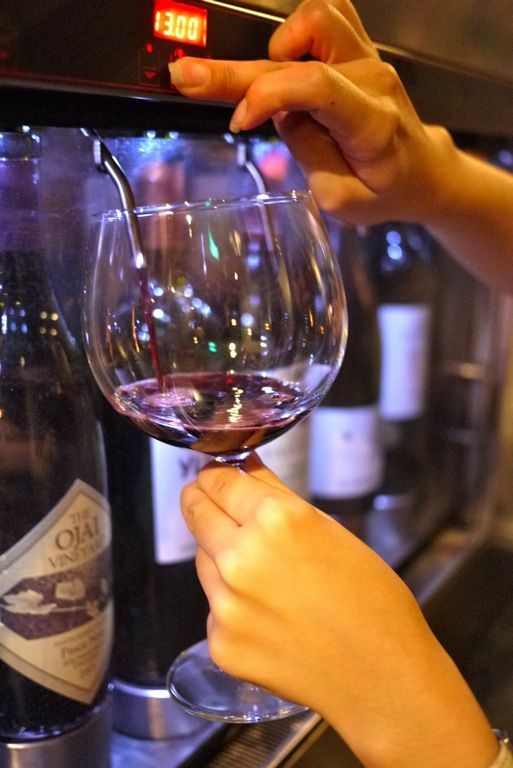 The Ojai Pinot Noir 2007 is another good quality easy drink that goes with any meat from chicken to pork. This is a rich, ripe fruit pinot that comes from America, California. It has the typical ripe fruit flavors but is still delicate on the palate. The Yllum Reserva Malbec 2007 is another delicious red that we enjoyed. Smooth, ripe fruit, rounded with a little tannins; it's almost like biting into the fruit. This entry level Yllum from Argentina is yummeh and you can expect more from their top range! 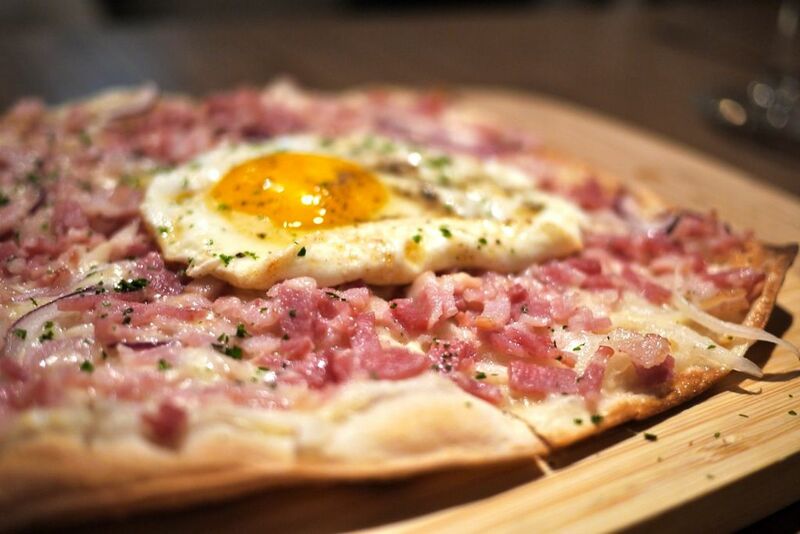 The Tarte Flamee- Classic Alsatian "Pizza" ($15) is actually a thin crust bread dough that is baked to cracker crispiness. We had ours with creme friache, onions, bacon and egg and i loved how the yolk coated the slice to give it that extra moisture. The onion may be a little overpowering but it was delicious nonetheless. Vegetarian option is also available. 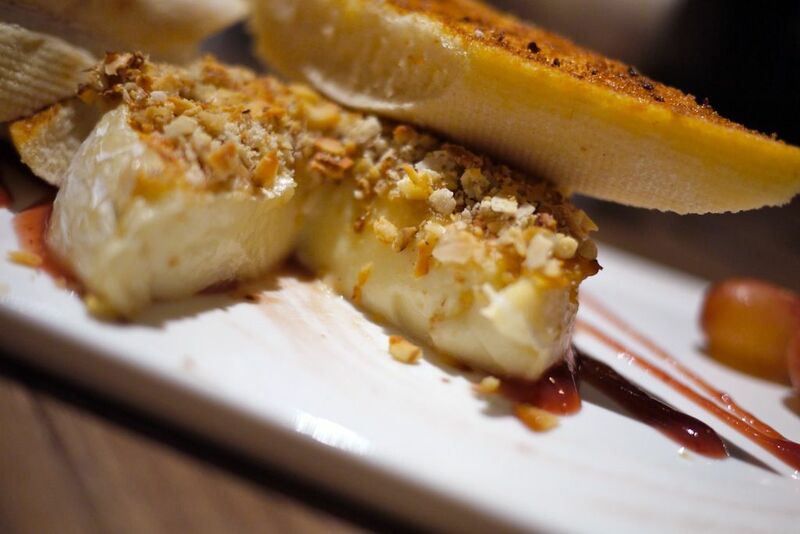 If you love cheese then the Baked Brie with Nut Crust ($18) is made for you. Mind you this is an entire round of oozy brie baked with roasted garlic and nuts. Spread it on top of the crispy garlic bread with pillowy interior and you have a winning formula. 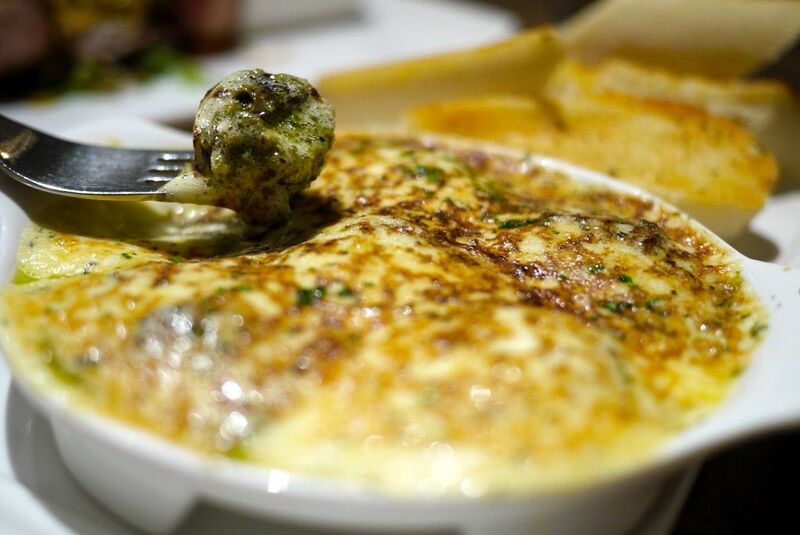 The Escargot with herb and garlic-basil pesto (1/2 dozen $16) is a must order. W and I mopped the sauce with our buttered bread and left nothing in our pot. It can be so hard to find a sauce this flavorful and i liked how the snail had absorbed all that essence thoroughly. 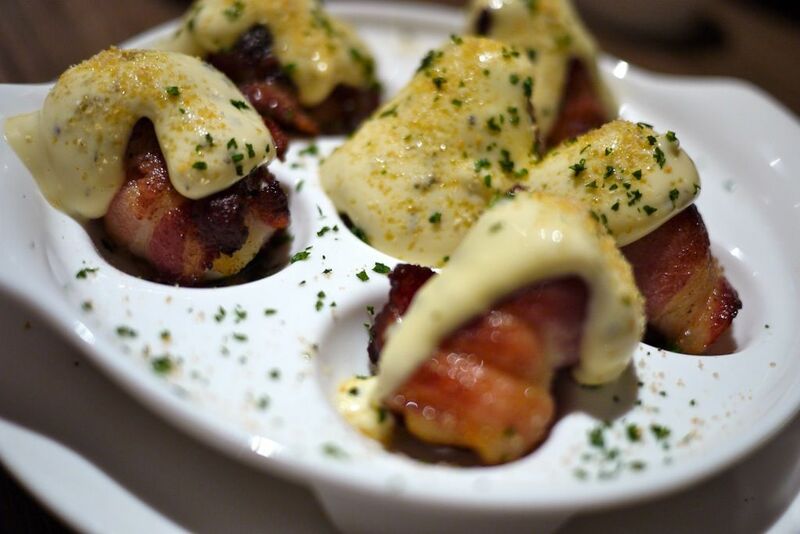 You got to be crazy to say no to the Bacon wrapped Scallops ($18). The rich Bernaise sauce was the icing on the cake and had me ooohing and aaahing as i chewed on the juicy morsel. The Roasted Pork Parcels ($16) was undoubtedly our favorite dish of the night. 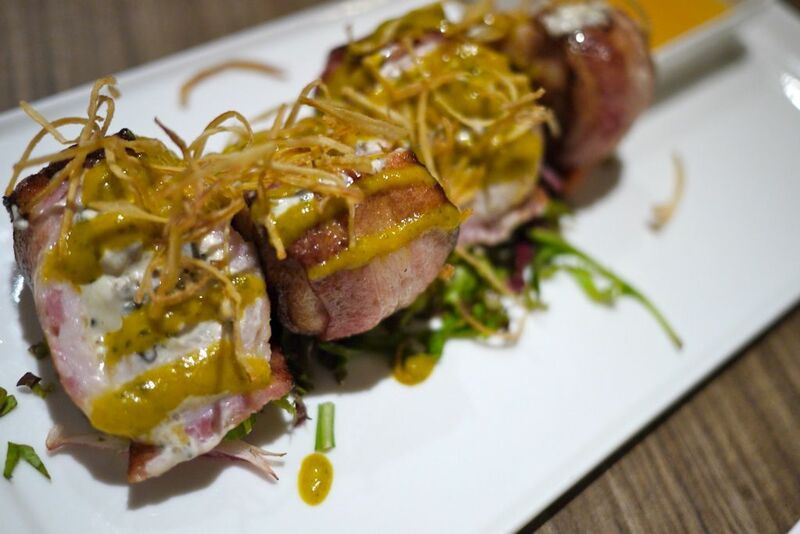 Juicy pork fillets stuffed with herb filling, mushroom, cream cheese, wrapped with pork belly and roasted and then topped with apple sauce. Pair this with the Leth Rottinger; this wine complimented the dish and brought out the sweetness of the pork. TOO GOOD. 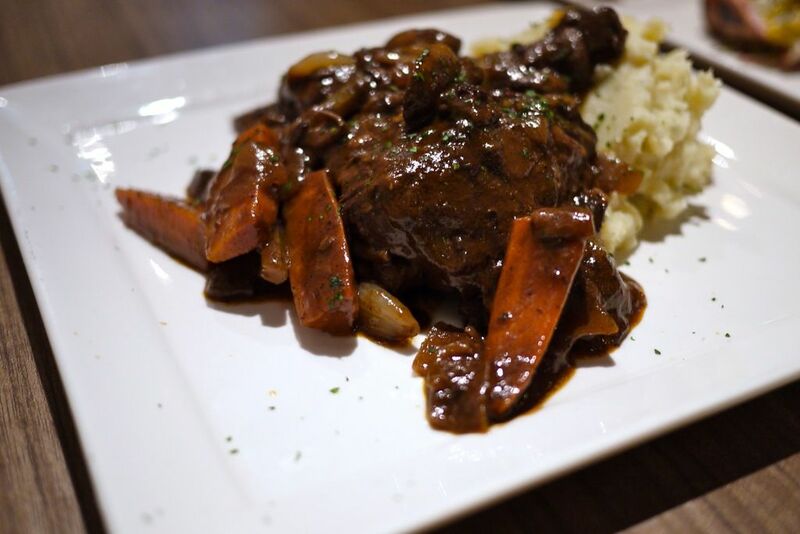 The Coq-Au-Vin ($24) was one huge plate of traditional French chicken stewed in red wine.The meat was tender but we found that the dish was a little salty for our liking. If you're a big eater, you'd love this dish. The garlic butter mash was hearty and i love that it still has the potato bits in it. No dinner is complete without dessert and wine! 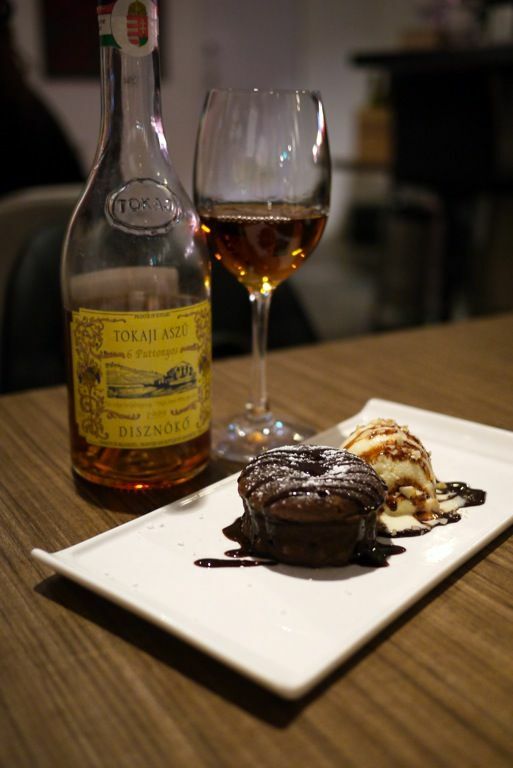 We paired the Moelleux Au Chocolate ($12) with the Hungarian Disznoko estate 1999 Tokaji Aszú 6 Puttonyos. It was like drinking nectar and this wine is fresh and well balanced with a delicious long finish. This 1999 was the best vintage of the 90s. 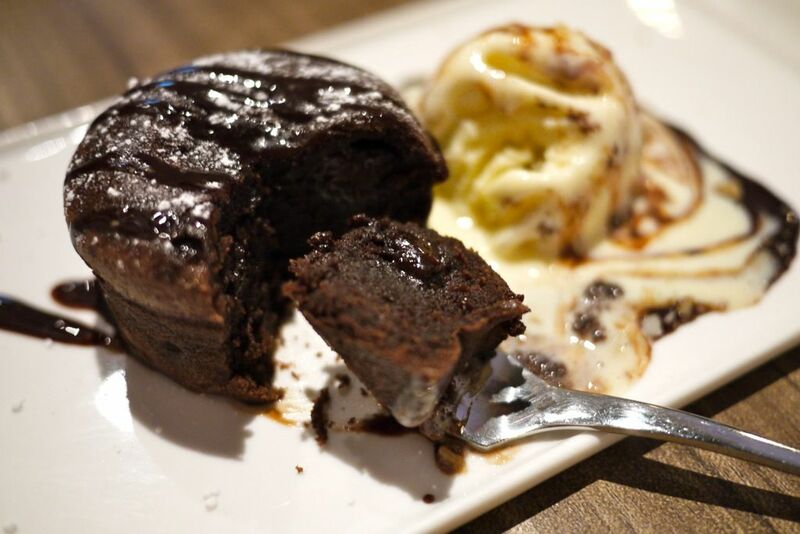 The cake is not exactly a lava cake and certainly not as rich but i liked the lightness of the flour. Perfect sweet ending to the night. What's sweeter was the bill. Our bill came up to $233.55 (heh heh) and with the Palate Card, we received a 50% discount. Say wert?! Happy bellies and happy pockets! For more information on the Palate Card, you can read my post here or visit www.palate.sg. So here is the first Palate Card giveaway! This is what you need to do to win a Basic membership card worth $428. 3. Tell me why you should win the Palate Card. Giveaway ends midnight 19 July! Remember to like my FB page if you haven't done so. :) Good luck!